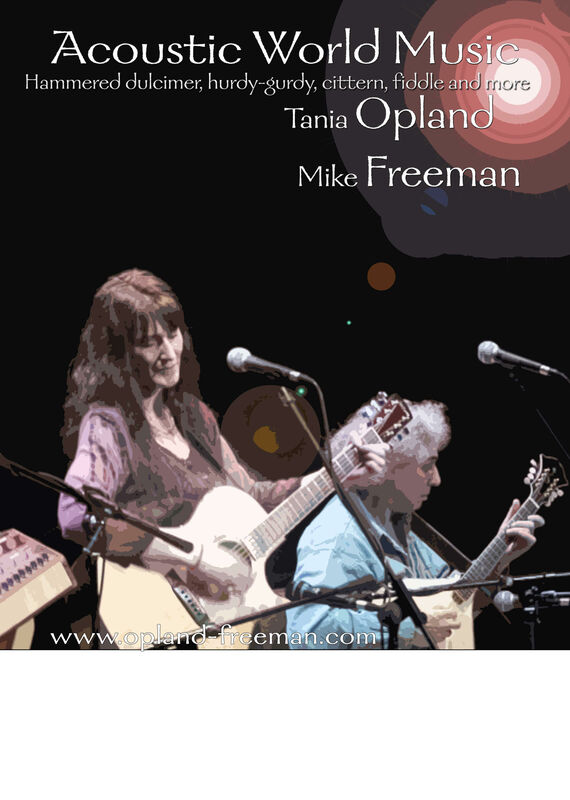 THE CENTER FOR MUSICAL ENRICHMENT PRESENTS HOUSE CONCERTS! We feature the best in internationally known musicians whose music far transcends the norm. All concerts are in Port Townsend, WA. Address given when you reserve your seat. Since 1995 Tania Opland and Mike Freeman have been touring internationally from home bases half a world apart. With songs in several languages and from many cultures, they use more instruments than any sane duo would travel with: hammered dulcimer, guitar, recorders, cittern, assorted unusual violins, Native American flute, ocarina, vielle-a-roue, percussion, and probably more. MIKE FREEMAN’s roots are in Eastern Europe, with grandparents from Russia, Romania and Hungary. Born and raised in Manchester, England, Mike now lives in County Kilkenny, Ireland. He has accompanied Middle Eastern and African dance troupes, and performed at countless festivals throughout Great Britain. TANIA OPLAND has homes on an Indian reservation in Washington State, in Kilkenny Ireland, and in Anchorage, Alaska. She has performed in the U.S., Canada, Russia, Uzbekistan, Scotland, Ireland and England. To reserve your seat, email laurie@laurieriley.com . The address will be given to you when you register.